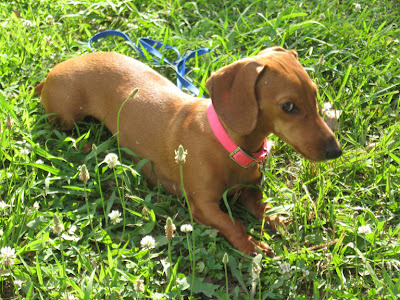 Home » dachshunds , dogs , overwhelming cuteness , tammy » It's a sunbathing pup as Tammy Tuesday returns! It's a sunbathing pup as Tammy Tuesday returns! So today I took her outside so she could do her "doggie business" and the first thing she wanted to do was head to her favorite place in the yard. I don't know what it's allure is, but there's this one little area of lawn that Tammy will go to, lay down and often roll on her back and enjoy the warmth of the sun shining on it. I guess it's just her "layin' spot".